smonk you: the best freaking daddy blog ever: Is it a boy or a girl? smonk you: the best freaking daddy blog ever: Is it a boy or a girl? 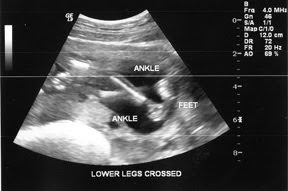 As I said in my earlier post Staci was able to weasel her way into getting an ultrasound a week early so we could find out the gender of the baby. Staci made up a card that we gave to the nurse running the ultrasound. It had 2 boxes on it. One with boy after it, the other with girl. We told the nurse that instead of telling us what it was we'd like her to mark it on the card and put it in an envelope. Then Staci and I would go out for a nice lunch and open the card together and reveal the surprise. Again our pre-kid was flipping around like crazy. We saw a good heartbeat (150 bpm) and the hearts 4 chambers looked great. The head, abdomen, sacrum and all that stuff measured perfectly. We were able to see all it's leg and arm bones, which was pretty cool. Then came time for the nurse to find out what we were having. Staci and I closed our eyes while the nurse did her magic. After 20 minutes she printed this picture out. It is of crossed legs. The pre-kid was in a position that made it tough to see what it was. To add to that it's legs stayed crossed the whole time even though it was moving around. The nurse couldn't tell what it was. She couldn't see a thing. The pre-kid was being modest. Not a bad thing if it's a girl. The irony is, if you read my last post, that the only thing we know right now is that it looks healthy. And that's great. Staci is really bummed. I'm actually kind of happy. From the start I didn't need to know what we're having. Plus Staci has a hard time with secrets. If she has one for me she'll say 'I got you a surprise, do you want to know what it is?' And she doesn't like when she knows I'm trying to surprise her. She always tries to guess what's up. But when I do surprise her she is so happy that she glows. And I love it. We're talking things over right now. I think we should wait to be surprised. We're doing a white bedroom and have some bright decals we're putting up but nothing is gender specific. Plus the gear we've bought, stroller, car seat etc. is all gender neutral. I think Staci is on board. I think she's getting excited about being surprised, but we'll see how that all plays out. Well congrats on whatever it is...I'm with you on the pink frill and blue baseball caps...not ahuge fan. I have been finding that the most gender neutral animal on shirts etc. is a giraffe...not sure why.